I'm Not A Monkey! Why On Earth Would I Want To Sleep In The Trees? One of the main reasons Scandinavians have a better quality of life is because they never lost their connection with nature like the rest of us. That and the beautiful people… and the vodka! 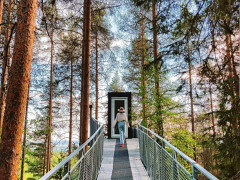 Based in Northern Sweden, approximately an hour by car from Luleå (Kallax) airport, Treehotel offers unique hotel experience: Contemporary rooms, high in the trees in the middle of unspoiled nature. Here you can forget about your everyday life, enjoy the serenity, and rejuvenate in a sophisticated yet familiar environment. From Treehotel’s rooms, you get a fantastic view of the Lule River valley, miles of forest and maybe even some trolls if you’re very lucky! Wanna Know More About These Treehouses And Activities? There are many different styles of treehouse to suit your needs - The Cabin is a 24m² capsule which accommodates two people, with a double bed, bathroom and terrace. 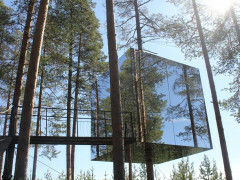 The Mirrorcube is an exciting hide-out among the trees, camouflaged by mirrored walls that reflect their surroundings and you can even stay in a UFO designed tree house…There are dozens of exciting and fascinating activities - from meeting the native Sami people to white-water rafting, kayaking, dog-sleds and horse-pulled skiing! You can go ice-fishing or photograph the Northern Lights, go on a Moose Safari and even experience a Bear Dinner complete with a bedtime story from the Sami People! There are dozens of exciting and fascinating activities - from meeting the native Sami people to white-water rafting, kayaking, dog-sleds and horse-pulled skiing! You can go ice-fishing or photograph the Northern Lights, go on a Moose Safari and even experience a Bear Dinner complete with a bedtime story from the Sami People! C’mon! Get those Christmas Reindeer Cardigans out and click the link for details! C’mon! Get those Christmas Reindeer Cardigans out and click the link for details! Kick off your boots, get back to your roots! C'mon - when was the last time you had a bedtime story?